What do Shakespeare and George RR Martin have in common? Apart from seeking inspiration from history, both writers may have immortalized Pontefract Castle in Yorkshire, England. George RR Martin may have found inspiration in the dark legend of Pontefract when he created “grim, unlucky” “cursed” Harrenhal. Pontefract Castle has been engulfed in so much ill luck, death, torture and destruction that, in its time, contemporaries feared it. To add to its cursed reputation, Pontefract’s first owner built it on a Anglo-Saxon burial ground. When Lannister troops bring Arya, Hot Pie, and Gendry to Harrenhal as prisoners, the scene that greets them fills us with dread. Harrenhal is a blackened, twisted, burned-out ruin that has become the site of horrific torture and imprisonment. Built centuries before during the War of Conquest, Harrenhal’s first owner never would have believed its current state or reputation. Note the similar silhouette between the ruins of Harrenhal on the right and the distinctive lobe shape of Pontefract’s round tower (or keep) on the left – likely unique in England. A 1530 description of Pontefract describes the Keep as having six towers.1 “Clash of Kings” describes Harrenhal’s gatehouse as having five immense towers. Harrenhal © HBO. Not unlike Harrenhal, Pontefract was an enormous, majestic castle that fell to ruin. Dating back to at least 1086, Pontefract was the principal castle in Northern England, and, in Edward I’s words, the “key to the north.” Pontefract was also likely one of the strongest and most impressive castles in England. While the king and magnates left other castles to decay, they funneled money into Pontefract. Repeatedly rebuilt and renovated, the castle covered over 8 acres with soaring towers that were at least 100 feet (30.5 m) tall. (In contrast, the Tower of London’s White Tower – once the tallest structure in London at its 1098 construction – is 90 feet (27 m).) Pontefract’s Round Tower, its keep, had 9 foot thick walls. King Harren believed he’d built a castle so tall and strong it was impregnable. His bannermen betrayed him and a game-changing assault from the air (dragons) melted the stone towers. Since then, no lord’s family has held Harrenhal for long – the families all die out. Legend has it the castle is cursed. Stories of the flaming ghosts of Harren and his sons as well as servants who are turned to ashes in their sleep heighten the castle’s evil reputation. With each change of occupant, Harrenhal is re-baptized in blood or misfortune. Janos Slynt, the City Watch commander, received Harrenhal as a reward for betraying Ned Stark. But, once Tyrion became Hand, he forces Janos to take the Black. When Tywin Lannister temporarily used Harrenhal as a base for his 30,000 man army, Harrenhal became a site of sadistic torture: the Tickler fatally tried to extract information from the Lannister prisoners by strapping a rat in a bucket to their stomachs. When Robb Stark’s army prepares to seize Harrenhal, they find that its Lannister custodian, Ser Gregor Clegane, has slaughtered all the Northern and Riverland prisoners. Jaqen H’gar kills the Tickler at Harrenhal (c) HBO via Wikia. Robb Stark claimed Harrenhal through his grandmother, but Robb met a bloody end when he died during the Red Wedding massacre. At the end of Season 3, to thank Petyr Baelish for helping to forge the Lannister-Tyrell alliance, Joffrey granted Harrenhal, along with a title, to Little Finger. Petyr recognizes Harrenhal for what it is: a dubious reward. The castle is too large to man and provision from the surrounding land. Will Petyr ultimately suffer an unlucky fate? Time will tell. Like Harrenhal, royal forces used Pontefract as a base. In the Wars of the Roses, Pontefract was the Lancastrian stronghold. Pontefract Castle painted by Alexander Keirincx (1600–1652) circa 1620. Pontefract was originally held by the de Lacy family. Back when the castle was still a motte and bailey style (not stone) structure, King Henry I confiscated it after Robert de Lacy didn’t support Henry during his power struggle with his brother Robert. However, King John gave Lacy back the castle in 1199. After Robert de Lacy died, King John repossessed the castle, even though he still let the Lacys live in it. In 1311, the House of Lancaster inherited the castle through marriage. Once upon a time, Thomas of Lancaster (1278–1322) was effectively the king of England after he rebelled against his widely hated second cousin Edward II, but ultimately Lancaster met his end at Pontefract. After rebelling against Edward II, Lancaster and the barons captured the king’s favorite Piers Gaveston, tried him illegally, and hung him. With the corrupting favorite out-of-the way, the barons assumed their problems were over and let Edward back on the throne. Deeply bereaved and out for blood, Edward slowly began to retaliate against the barons involved. Soon Edward had a new favorite, or perhaps, lover, whom he was showering in lands and offices: the greedy, ambitious Hugh Despenser. And the pattern began all over again. Hugh Despenser the Younger was a ruthless man who would do anything to achieve wealth. He coined a catchphrase for himself, “The Despenser may be rich and may attain his ends”. Perhaps, a “Lannister always pays his debts” is a catchier version of this? In Pontefract’s Great Hall, Edward II sentenced Thomas to die for rebelling. Because Thomas was his cousin, Edward reduced Thomas’ sentence from the standard treason penalty of hanging, drawing, and quartering. Six days after his defeat at the Battle of Boroughbridge, the executioner’s axe took Thomas’ head outside Pontefract castle. After Thomas’ death, the castle passed to Henry, Duke of Lancaster and then John of Gaunt. Pontefract moved into the hands of the king when John of Gaunt’s son Henry Bolingbroke overthrew Richard II, becoming Henry IV. This is where Pontefract takes on its bloody reputation. After Henry Bolingbroke overthrew the widely despised Richard II, he imprisoned Richard in Pontefract, or “Pomfret” as it was known in Elizabethan times. Nobody knows precisely how Richard met his maker – some believe he was left in a tower to starve or violently killed. What we do know is that around February 14, 1400, Richard’s body was taken from Pontefract and buried three days later. Richard III sometimes resided at Pontefract when he was duke of Gloucester. After he became king, Richard executed Anthony Woodville at Pontefract. When Arya arrives at Harrenhal, Ser Gregor Clegane’s interrogator, the “Tickler” is sadistically torturing prisoners for information daily. After picking a random person from the crowd, the Tickler straps a bucket containing a rat on the person’s chest. The Tickler wants to know the location of the Brotherhood without Banners, a rebel group. When the prisoner inevitably replies he doesn’t know, the Tickler instructs the Weasel to burn the bottom of the bucket with fire. The rat in the bucket frantically tries to claw and bite its way through the prisoner’s chest to escape being burned – and hideously kills the prisoner in the act. The Tickler – the sadistic interrogator at Harrenhal. Up there with Joffrey in terms of people we hate. © HBO, via Wikia. Harrenhal has an atmosphere of despair, like a penal colony, and at various points, so did Pontefract. During the Wars of the Roses, hundreds of prisoners were killed or jailed at Pontefract. To add to the men’s hopelessness, Pontefract had a vast, pitch-black winding network of dungeons. The corridors hooked in so no daylight could ever reach them. These inescapable pits were carved out of the bedrock 35 feet under the castle. Desperate prisoners etched their names into the walls. The ruins of both Harrenhal and Pontefract are allegedly haunted. Harrenhal terrifies Hot Pie. 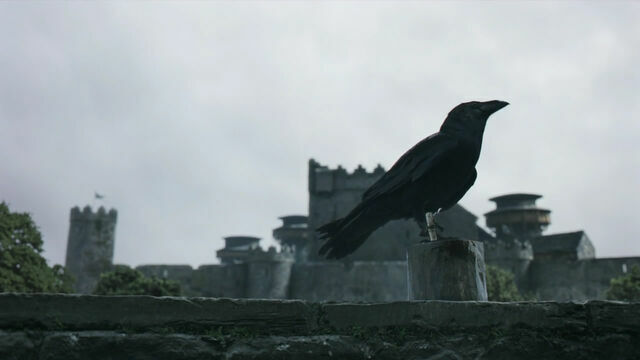 Arya’s Nan told her “fiery spirits still haunted the blackened towers,” warning Arya that sometimes men who slept there were “found dead in the morning, all burnt up.”2 Harrenhal’s symbol is even a black bat. By Elizabeth I’s reign, Pontefract was already falling into disrepair. Even though between 1485-1660, more money was spent on Pontefract than any other Duchy castle. Despite Pontefract’s incredible defensive value, it was not kept in good repair and allowed to deteriorate. After withstanding three sieges during the Civil War, the government dismantled Pontefract – actually making £3558 by selling recovered lead, timber, iron, and glass.3 But, if you believe ghosts haunt Pontefract, watch out on your next visit to Yorkshire. Many of Pontefract’s stones were sold and re-used to build houses in the area. This means that parts of Pontefract live on to this day in places you’d least expect to find them. Pontefract is not where you have placed it on the map, I’m afraid. No, I’m not from Pontefract. Sadly, I’ve never even been there. I did a lot of web image searches (and research) to try to understand what it looked like – now and in the past. Are you there on vacation? I came from Pontefract and used some of the castle stone to build and repair houses in Pontefract, one of them being priest bridge cottage near the valley gardens Pontefract, this cottage was renovated and built by its owner a man called Les Bloy sadly now pass away, but I worked on the cottage with him and I am still here now 73 years old.2019.